Renting a car in Portugal was easy, and totally worth it. Ok, slight correction - DRIVING in Portugal was easy - the car rental part was a bit of a hassle, but still worth it. We started our driving adventure of Portugal in Lisbon. I had researched a few different car rental companies, and had finally settled on a booking with Budget Rental Car, through Expedia's website. Since we were planning on driving pretty extensively throughout the trip, and since RW was going to be traveling with us for half the trip, we ended up with a slightly larger car than we normally would rent in Europe. We opted for a compact 4 door - a Ford Focus or similar car with automatic transmission (I'm the dork who can't drive a manual, and parts of Portugal are very hilly!). Our total for a six day rental was $303.07 after taxes. TRAVEL TIP: Rental companies in Portugal (at least Budget/Avis) are very strict about the times that you have the car. When we rented ours, a note popped up that an extra day would cost $117.85 while an extra HOUR would cost $239.08! It's also cheapest to drop off at the same time you pick up - I found large fluctuations in price if for example you pick up at 1pm and return at 6pm. We'd set our rental for a 12pm pickup, but didn't realize that we couldn't pick it up earlier, so we arrived at about 10:15am. They didn't even have a car available at that point, but they let us leave our bags in their office while we walked and found a cafe to have a coffee at while we waited. We returned at 11am and they had the car available - but let us know we would need to have the car back on our return day at 11am. The Budget office we went to was a shared Avis/Budget office in Lisbon on Av. Praia da Vitória. It was a very small office, and when we first arrived at 10:15am, they were helping two other groups - one family who were having issues with returning their car, and another family with three small kids who were picking their car up. When we returned at 11am, both groups were still there - so we immediately wondered why. Our pickup was fairly easy - we added an extra driver and the rental of the Via Verde toll transponder, bringing our total for the week up to $417.39, and they brought the car around quickly. 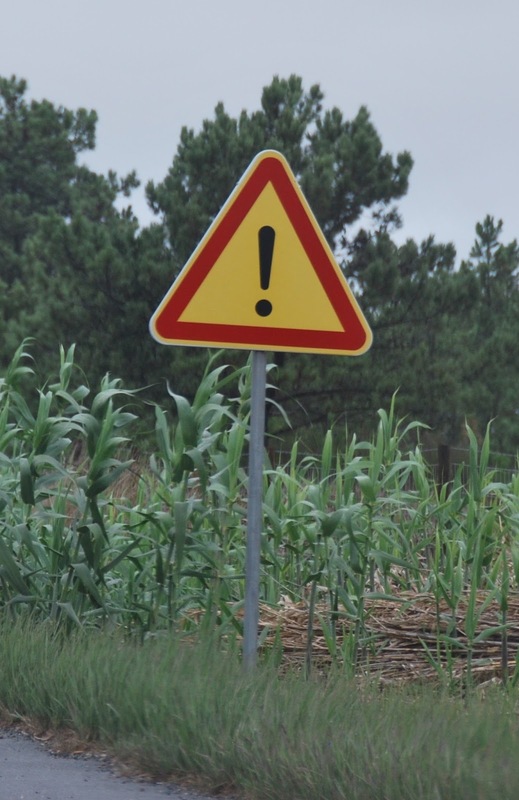 Road signs that remind you to pay attention! 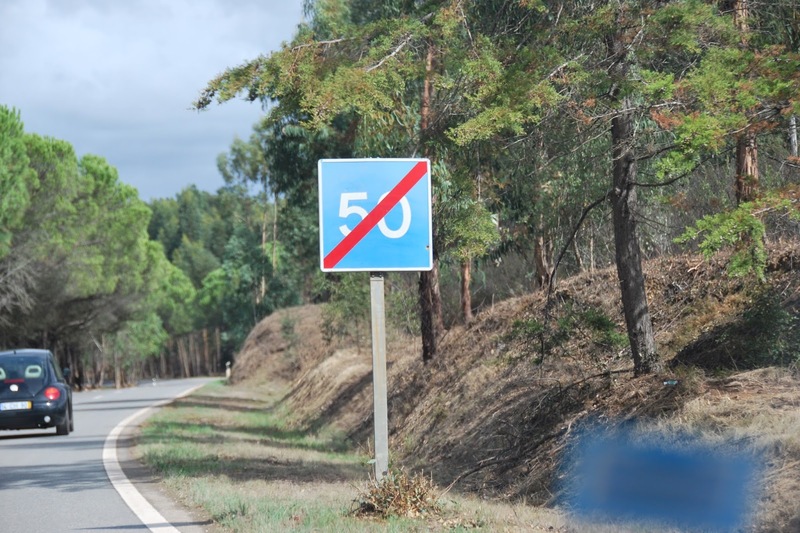 Most of the main large highways (mostly, any which have an "A" prefix) in Portugal have tolls. The tolls vary in price - anywhere from €0,40 to €20, depending on your journey. The priciest one we hit was on the road from Lisbon to Porto, and it was about €20. When you're renting your car, you should have the option of getting a Via Verde transponder for the tolls. It costs a small amount per day (or week) to rent, but it's worth it so you don't have to keep track while you're driving. Ours cost about €6 for the week we had the car. The toll spots almost never have booths, it's all done electronically. There are signs when you enter the highways that designate the highways as toll roads, but you often don't realize you're driving through a toll until you've hit it and the Via Verde beeps at you. When the speed limit zone ends. The transponder in your rental car will keep track of what tolls you need to pay, and in our case, we were later charged by Budget about 2 weeks after we returned the car. When our bill finally came, it was for $91.34. Considering that half of that was the round trip to Porto, it was right about what we had been expecting it to be. There are definitely ways to avoid some of the toll roads, but be ready to spend a lot more time driving if you try it that way. 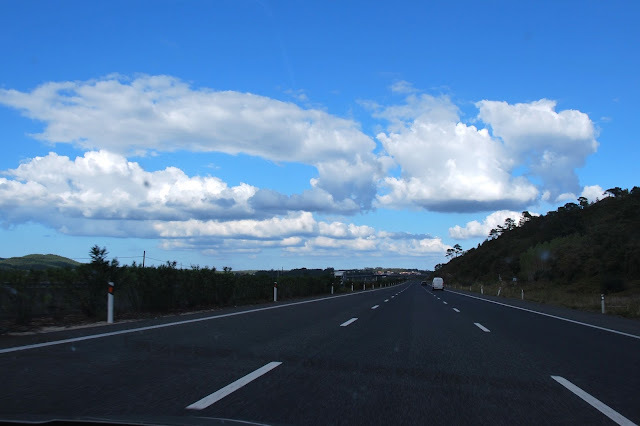 The toll roads are in amazing condition, and we never hit very much traffic on them, with the exception of when we were near the large cities (Lisbon & Porto). Apparently the lack of traffic is somewhat due to the expensive tolls, but in our case, we were more concerned about not wasting time on our trip than about saving the €. 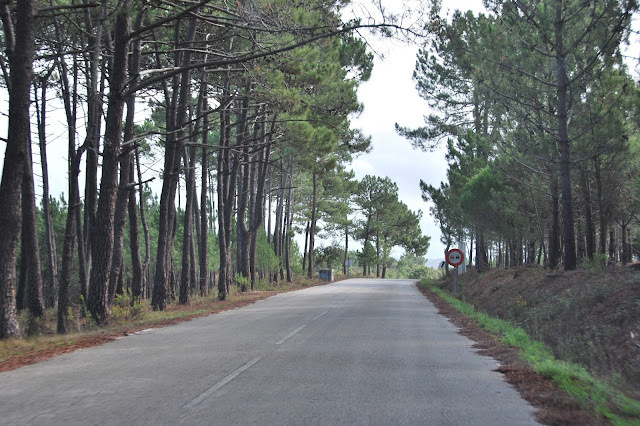 There's a lot more information on the tolls in Portugal on the Portugal Tolls website - and it even has a section towards the bottom of the main page with maps that show you how much tolls cost for pieces of journeys! One of the best things we purchased during our trip was a massive, detailed Portugal road map. We bought it at a gas station in the Algarve about 3 hours into our trip, when we realized that we were going to want to avoid the toll roads on occasion! TRAVEL TIP: Make sure you have an actual, paper map when you're driving in a new place, especially if you're out of the country. I had an international data plan, and RW had a European phone, but we often couldn't get a signal for Google Maps on our phones! Having an actual map and being able to navigate with us made the trip a lot better. 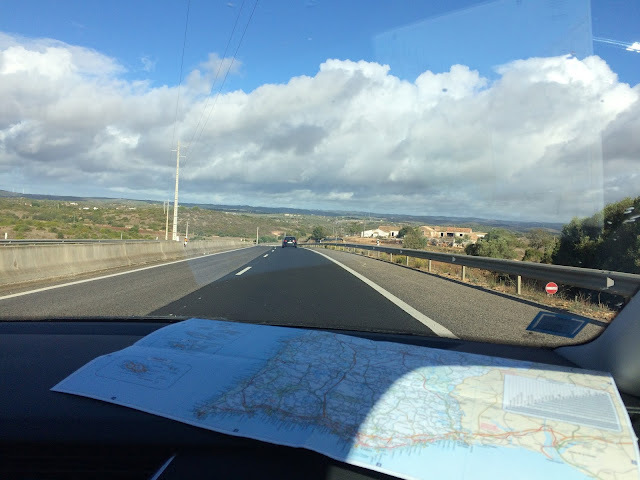 Having a map also allowed us to get off the beaten path and explore a lot of Portugal that we might have missed otherwise. But we also picked up another helpful tip that we used several times - when we were leaving a hotel or restaurant for a specific location, we would use wifi to get directions from Google Maps, then screenshot the directions and route. When we didn't have data plans turned on, or when there was bad reception, this helped us stay on track. Lovely trees along the way! Returning the rental car was definitely the most frustrating part of our experience. During our trip, one of our tires developed a small bubble in it. When we returned the car at the end of our trip, the manager of the Budget office informed us that they would be charging us for two new tires. Here is where it would have come in handy to have taken photos of the car when we received the rental: the tires were already pretty worn, and we know that it was basic wear and tear on the tire. 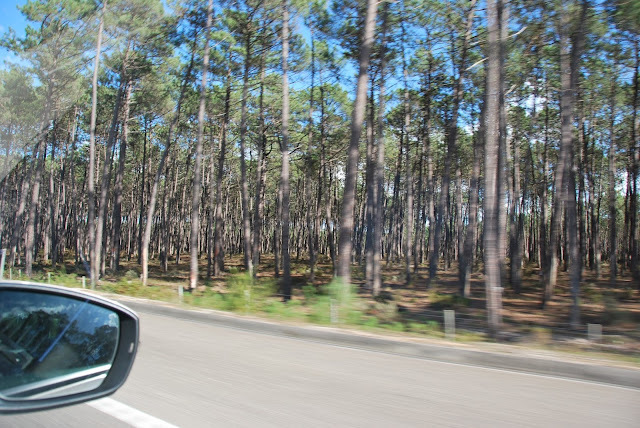 TRAVEL TIP: TAKE PHOTOS OF YOUR CAR AT THE START OF YOUR TRIP. Also, inspect the car carefully with the rental agent before you take possession, and point out any dents, scratches, or issues that you can see. I can't tell you how much time and effort doing this would have saved us. When our car was brought up to the top of a driveway, it blocked traffic in and out while we loaded up, and the outside street was quite narrow. By then, we were very eager to get on our way, so we didn't do a thorough inspection or take photos of the car - next time I will not care about inconveniencing anyone and will take the photos! We had already seen for ourselves the issues that people were having at the office we rented from - it seemed like everyone we saw returning a car there had problems upon returning, which made us wonder if was all just a huge racket. We first dealt with a very nice woman who explained their policy. Hubby asked to speak with the manager, who was sitting 5 feet away in his office with the door open. We argued with the manager at the Lisbon office, who basically blew us off by saying we would need to call the regional office. He retreated to his office, then the original woman helped us call the regional office. The regional office told us the charge was at the discretion of the local office manager (surprise surprise), who had since closed his door. Since we weren't getting anywhere with the local office, and we didn't want to waste any more time of our last day in Portugal arguing with Budget, we left. We'd spent about 90 minutes at the rental office, and we wanted to get on with our trip. We didn't sign any documents after returning the car, and made them give us a copy of their incident report, along with taking photos of the bubble in the tire. It took another few weeks of back and forth with Budget once we returned home, but we were ultimately credited for the $273.41 that we were charged for the two brand new tires. Unfortunately, the whole experience with the Lisbon Budget office felt a bit like a scam - the bubble in the tire was clearly from the normal wear and tear of a rental car, and that was covered by the insurance we'd gotten with our rental. Not to mention the back and forth with the local and regional people - that part was the worst, since it became clear in our conversations that the local manager could have made the call to not charge us. 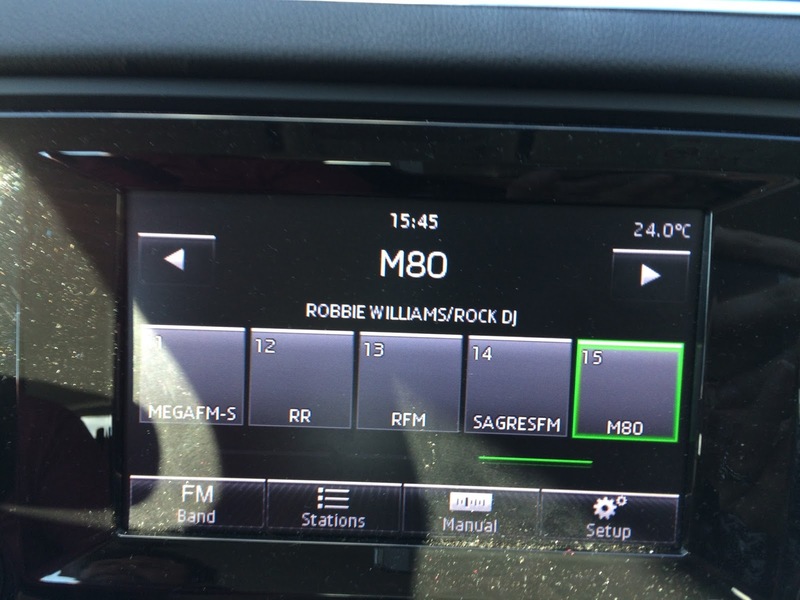 The radio had lots of English music - but some was a little dated! Still, even with all of the issues at the end of our trip, it was absolutely worth it for us to have rented a car. I'm not sure I would use Avis/Budget in Portugal again, but then again we did have some leverage with dealing with an international company once we were home. I think if you take the precautions I mention here (taking photos of the car, a good inspection upon receiving the car), hopefully there won't be any issues with a rental!